Published in the September 2012 issue of Fisherman’s News. In the construction or reconfiguration of an industrial or marine refrigeration plant, the old question of whether to choose ammonia refrigerant or one of the halocarbon “Freon” refrigerants resurfaces, with a sincere attempt by the owner of the facility or marine vessel to do the right thing. On the one hand, ammonia has a strong and longstanding presence in the industry; on the other hand, the halocarbons do not carry as many safety and regulatory concerns that ammonia does. Both sides of the debate have well supported arguments for their position – which makes decision-making even more difficult. Every difficult choice has a set of advantages and disadvantages, and the debate between “Ammonia vs. Freon” is no different. For example, one of the main advantages to ammonia, because of its overpowering odor, is that refrigerant leaks are “self alarming”. The main and most unfortunate disadvantage is that this “self alarming” nature of ammonia also attracts injury litigation should a refrigerant leak occur. On the other hand, the halocarbons are nearly odorless and leaks tend to go unnoticed by anyone outside of the maintenance group. That reduced risk of litigation is a great advantage. However, the fact that the halocarbons are nearly odorless creates a huge risk in that a large leak can silently displace the oxygen atmosphere in some areas of the plant, and cause a tragedy that ammonia refrigerant in a similar situation may not cause. hazardous concentrations, it repels people from a contaminated area. The bark is much worse than the bite; however it is the bark that drives litigation and regulation to the point that litigation and regulation are the main disadvantages to ammonia as a refrigerant. For example, on the regulation issue: the OSHA’s requirement for Process Safety Management on ammonia systems that exceed 10,000 lbs refrigerant volume (and less in the future, should the OSHA laws change). PSM, like all OSHA requirements, has its roots in good intentions, but it requires a huge amount of paper work and detail from the plant maintenance group, with errors and omissions in the paperwork resulting in substantial, and some say “confiscatory” fines. There are presently no such rules for halocarbon plants. 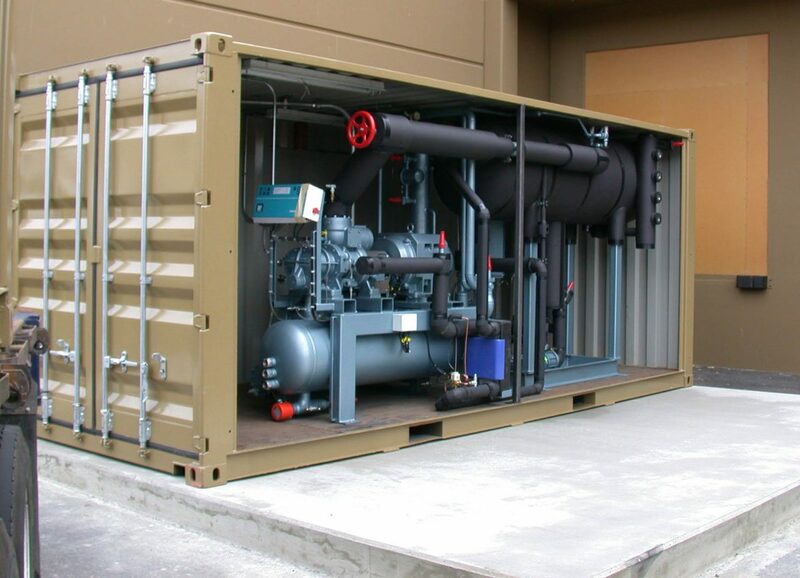 Most refrigeration plants of substantial size have traditionally used ammonia as the refrigerant. However, in the last twenty years we have seen more new plant construction in the less-than-2000 horsepower range being executed in halocarbon; and we see more and more ammonia plants of this size and larger converting to halocarbon. The reality is that after decades of the successful and well-proven use of ammonia as a refrigerant, plant owners and corporate board members are avoiding the use of ammonia in favor of halocarbon refrigerants in order to avoid catastrophic legal and regulatory costs. Even small non-consequential leaks often result in personal injury claims by plant employees. A large catastrophic ammonia leak is always newsworthy, often results in neighborhood evacuations, and always attracts injury and damage claims. Other very certain results of a major ammonia release are increased regulatory scrutiny of the plant, and opportunistic reprisals from local politicians. In some states, California being a good example, new construction in ammonia is strongly discouraged, and in some jurisdictions, it is prohibited. Furthermore, the last decade has seen an increase in copycat legislation in other regions as well. As an old ammonia engineer myself, I find these developments to be most unfortunate. However, the reality is that there is continued pressure to impose increasingly more stringent regulations on ammonia, and with it come huge regulatory fines, and personal injury litigation. These are costs that far outstrip the difference in the per pound cost of the refrigerant. In some jurisdictions across the country, there is a requirement for ammonia plants to have trained and certified operators to be on duty around the clock, regardless of the production schedule whereas halocarbon plants can be manned according to the regular business schedule. (Please note, we strongly advise that operators comply with EPA regulations and have basic refrigeration training regardless of the refrigerant used). You may have heard it said that ammonia is a more efficient refrigerant; but a choice between ammonia and halocarbon will not substantially change your energy expense. That efficiency claim has to do with the refrigeration quality of ammonia per pound as compared to other refrigerants; but that is not to say that ammonia is more energy efficient. In fact, at low food freezing temperatures (-30F to -45F), most halocarbons have the advantage of smaller, less expensive compressors and lower compression energy than ammonia. At higher temperatures, ammonia tends to come out on top. However, in general, there are many more effective ways to gain energy efficiency in a refrigeration plant than in the selection of a particular refrigerant.Ammonia has a low-level flammability in air that under a very narrow range of circumstances involving ammonia concentration in air, relative humidity and temperature, has caused explosions. Although the occurrence of these events is extremely rare, they tend to be catastrophic, and therefore worthy of mention.Ammonia systems have slightly higher maintenance costs – due to two factors – the first is in returning compressor oil that naturally migrates through the system. Oil return is a manual operation with an ammonia system requiring the collecting of the oil in a special pressure vessel, and draining that oil on a regular basis for disposal. In a halocarbon system, oil return is automatic, the oil stays in the system, and the system rarely has to be opened up for oil draining. A second major maintenance issue is that in low temperature plants, the “low side” or “cold side” of the system operates at pressures below atmospheric, which means that minor leaks that develop around valve stems pull air and moisture into the system. The air requires a special purging operation (or special equipment that does the purging automatically). The moisture infiltration in ammonia systems is more problematic, and requires special attention and equipment to remove. In all of the current and commonly used halocarbon refrigerants, temperatures down to and below -45⁰F (the food freezing range) are all done with the low side pressures above atmospheric. There is no air and moisture infiltration in these halocarbon systems. Ammonia systems tend to be better maintained than halocarbon systems because leaks around valve stems, compressor shaft seals, and other leak-prone devices announce themselves due to the pungent odor – even at very low concentrations. A maintenance department cannot avoid due diligence with respect to ammonia leaks like they can in a halocarbon system where small leaks can go unnoticed or ignored simply because they have no odor, and are more difficult to locate. Ammonia leaks have no environmental impact in terms of ozone depletion or global warming effect. Ammonia breaks down very quickly once it leaves the system. In fact, most of the ammonia produced globally is destined for agriculture where it is injected directly into the soil in order to boost the nitrogen content for the next crop. Nitrogen fixing bacteria metabolize the ammonia and convert it to nitrates, which the plant can use as a nitrogen source. The long-term environmental safety of ammonia as compared to the halocarbon refrigerants is a considerable advantage. The cost of Ammonia is very low compared to any of the halocarbons. The market price of ammonia is established by its activity in the agricultural sector. Currently there is a great deal of effort among the major refrigeration equipment manufacturers to mitigate the regulatory and legal hazards associated with ammonia refrigerant by the use of a combined carbon dioxide and ammonia system. The carbon dioxide portion of the system does the cooling out in the production areas and cold storage, and the ammonia portion of the system is contained in an isolated, well-ventilated machinery room where ammonia quantities are kept relatively low. The technology shows some great promise with respect to effective freezing, although the components are more expensive at this time because of the increased pressure range, and because the CO2 refrigeration industry is not yet fully developed. New regulations for classed fishing vessels are currently being developed, with a fair amount of debate and advice coming from vessel owners and the marine refrigeration industry, with the focus being the implementation of sensible, cost-worthy rules that will have a true impact on the safety of the vessel and crew. Is vessel size a determining factor on crew safety in the event of a major ammonia leak? In other words, is there enough deck space to escape a vapor plume during calm weather? How should machinery spaces be constructed and to what level of isolation? How should ventilating equipment for those spaces be selected and used? Can ammonia containing machinery (i.e. freezing equipment) be safely located in the processing areas of a vessel, and if so, under what conditions? What kind of safety equipment and systems must be in place, how are they to be utilized, and what kind of training programs are needed for maximum effectiveness? Knowing the issues, advantages and disadvantages of every type of technology and how it affects the construction and operation of a refrigeration plant in any arena.